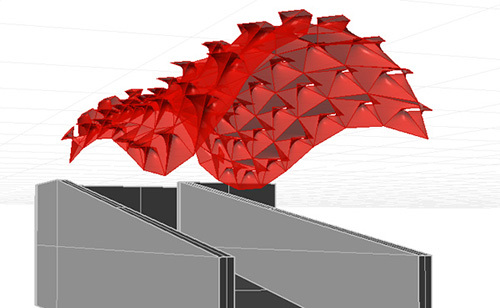 Part of a series of experiments connecting traditional architectural modeling (Rhino) with algorithmic computer vision (openFrameworks). Some earlier experiments are available on Vimeo. A camera tracks motion on a ramp between two buildings, under a glass atrium. A canopy overhead opens over pedestrians as they pass underneath, creating areas of light only on passersby. Motion data is gathered with openCV in openFrameworks, and passed via OSC to Rhino/Grasshopper.